Ill get this bugged for the devs to fix. Since typos are pretty minor bugs, we could collect them all here. Found one in the Night Market amulet's description: "optimisim"
Pretty certain that the Sub-Race description for Mountain Dwarf contains a typo "Mountain dwarves (Aptapo) originated on the content of Aedyr..."
Edited by MaximilianXimenez, 12 May 2018 - 12:35 AM. You sure it's a typo? Sawyer does love his German. Can we sticky this please? Stickied, for now. Post any typos, here. In the weapon proficiency description of the pike (exposing strikes) it says "opponent's" where it should say "opponents". "... I think they'd have rather given up the land then have it come to violence." It should be "than" since it's comparative. Captain Furrante - "It has, lamentably, remained unfindable since. I belive it may be why she searches the seas, yet." A sash's name is not displayed. In description there is "Armor piercing" instead of "Armor vs pierce". Edited by Sotnik, 12 May 2018 - 12:08 PM. Swift strikes and Frenzy speed bonuses are wrongly displayed. Character creation, weapon proficiency, blunderbuss: "Overloading shots with powder causes short a range incendiary, but the thick smoke is distracting to the wielder." I think this should read: "Overloading shots with powder cause a short range incendiary, but the thick smoke is distracting to the wielder." Gatecrashers - Slugger: +2 Might, 50% chance to perfrom knock down attack against target with Critical Hits in melee. In the install folder for the game, Tim's Cookbook is in a folder called "Ditigal RPG Cookbook." Yseyr the Berathian: "Speak. Than perish. Less'n ye've a cause from Berath to fare here." 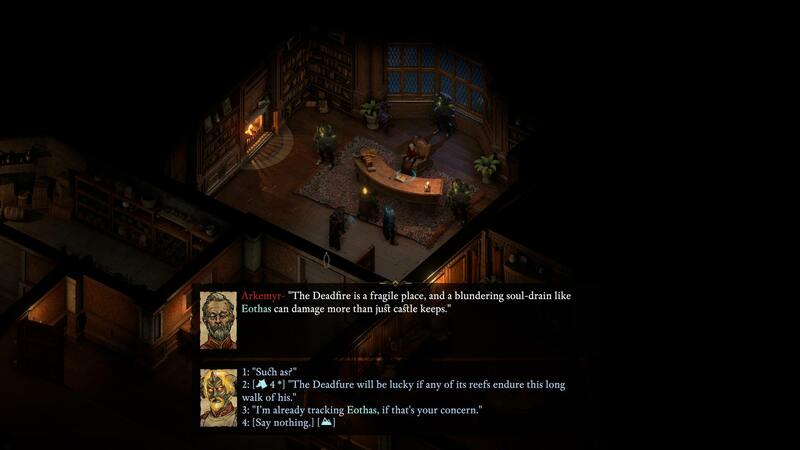 During your conversation when you get summoned to speak with Arkemyr after raiding his vault, Deadfire is misspelled. Came across a fair few typos early on, but didn't note it down. After I saw this thread created I have started to take screenshots of them. So here is the first one. In this interaction it says "aliment" instead of "ailment". Should probably have a comma after "mind you" as well. Gale Armor Light or Heavy?